Hutchison Ports Thailand (HPT) began operations at Laem Chabang Terminal D on Monday, when the 5,556 teu MOL Grandeur came to call. The new $600m terminal is HPT’s third at Thailand’s major container gateway of Laem Chabang. The new deepsea facility could pave the way for a 40% capacity increase in the largest vessels calling at the port, helping Thailand challenge Malaysia and Singapore for coveted South-east Asian transhipment traffic. 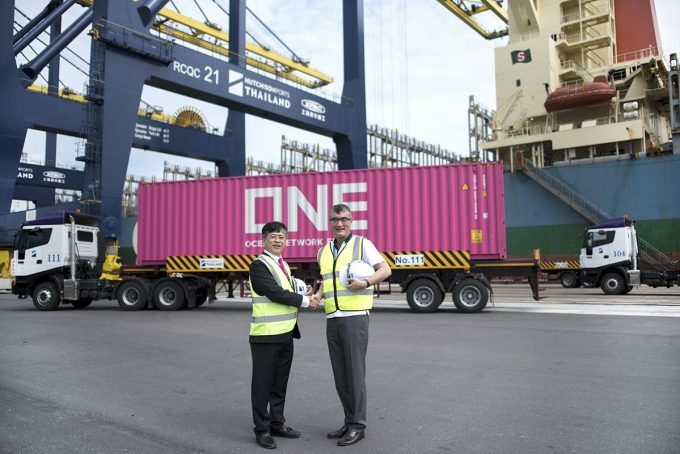 Stephen Ashworth, Hutchison Ports’ MD for Thailand and South-east Asia, said the terminal could handle some of the largest container vessels currently in use. “Some shipping lines are showing interest in deploying 14,000 teu class vessels on port rotations that include our Terminal D,” he told The Loadstar. The current average vessel size at Laem Chabang is around 3,000 teu, Mr Ashworth said, with the biggest at 10,000 teu. He said he expected the new facility to be at capacity soon after operations began, “judging from many economic indicators”. He added: “Including our investment in Terminal D – testament to our confidence in the trade prospects in Thailand and particularly in Laem Chabang port – we also expect to see growth in transhipment volumes in the medium to long term,” he added. On completion, the fully-automated terminal, equipped with remote control technology, will have a total quay length of 1,700 metres, 17 super post-panamax quay cranes, and 43 electric rubber-tyred gantry cranes. HPT was in need of new capacity following strong growth in recent years, including a 16% jump in volumes in 2017. The terminal operator already handles around a third of Thailand’s total 8.3m teu annual throughput. The first phase of the terminal (D1) adds around 600,000 teu to HPT’s current total capacity of 2.8m. This will increase to 1.2m teu once D1 is fully operational in 2019. Phases D2 and D3 will add 3.5m teu by 2024. According to HPT, Terminal D is an integral part of Thailand’s Eastern Economic Corridor (EEC), a $45bn special economic zone that aims to modernise the economy through improved infrastructure and innovation. The project includes plans to build double-track railways connecting Laem Chabang with key industrial zones. Meanwhile, bidding on Laem Chabang’s third expansion phase will commence in October, according to the Bangkok Post. Due for completion by 2025, Terminals E and F will increase the port’s capacity from 7.7m teu to 18.1m teu. Mr Ashworth declined to comment on the viability of this much additional capacity, noting that this was “the responsibility of Port Authority of Thailand”. Hutchison has not yet said whether it intends to bid on the additional terminals.